In my previous post I talked about how being seen is an important consideration for me while on outdoor pursuits in winter. Well here are a couple of things which will nicely tick that box. I love this design. There were a few to choose from within this range, but for me the Kashmir Yellow one was the no-brainer. It is a subtle yellow in variegated shades without going as far as garish, and with brown Indian-style flowery motifs on the front and back - rather like Henna tattoos. Why go for the usual reds, blues and blacks when you can have something a little more exciting that will surely brighten up a dull day? When I took the jersey out of its packaging I thought the fabric was a bit too thin for it to be described as heavyweight. But in fact the Sfero technical fabric keeps you quite warm while still being breathable. Since we are experiencing spring-like temperatures you may find you will need to pull down the zip a little as you trundle past the daffodils in December! If like me, your measurements fall between two sizes I would suggest going for the larger option as these designs have a snug fit. You might, if you are like me, prefer to have some "wiggle" room while riding. Although this jersey looks "fun" it takes quality seriously. 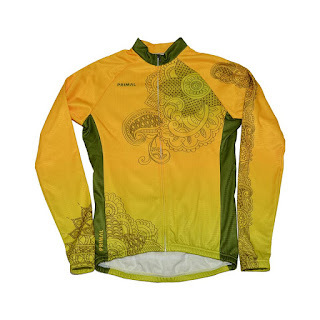 The finish is slick, there is generous space in the three rear pockets, and the lack of labels on the inside plus raglan sleeves means that there is no danger of the jersey rubbing or chafing your skin as you ride. Furthermore the integrated sun protection factor 35+ is an added bonus during these sunny days. I look forward to properly testing out the heavyweight properties of this jersey when the temperature drops - which is forecast to be on Christmas Eve - great timing! While it might be too warm at the moment for a jacket while running, it is not too dark. 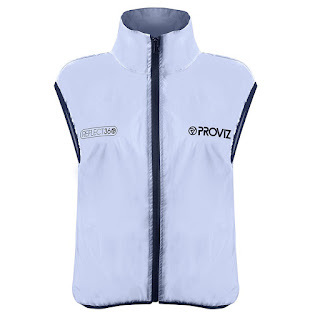 Proviz have gear which is equally useful for runners as for cyclists. 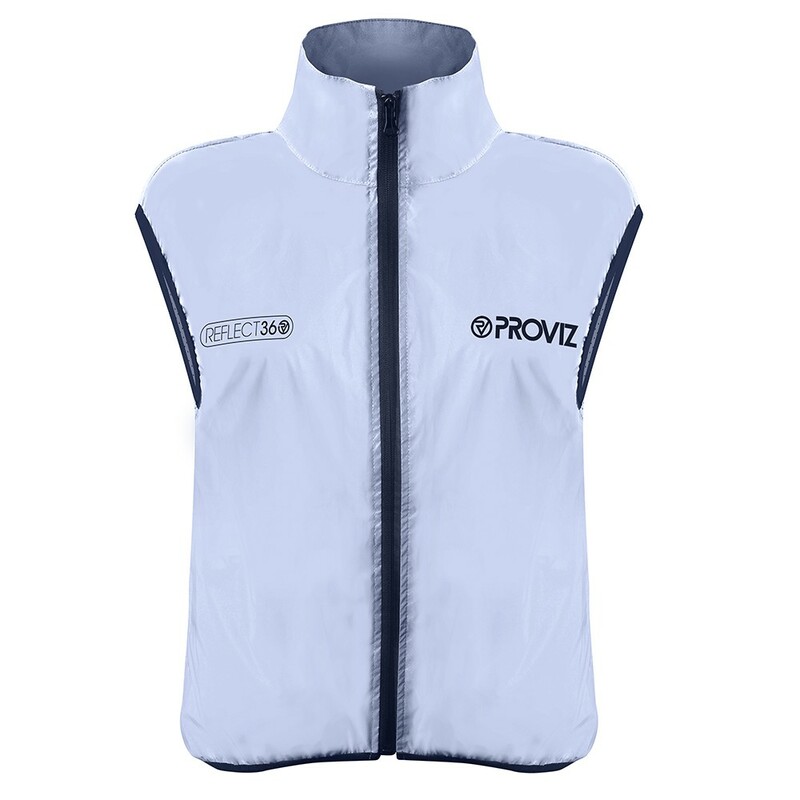 I particularly like this item, the Reflect 360 gilet. As with the eponymous cycling jacket it is 100% reflective, and you will be spotted from almost 200m away as you do your marathon training at night or in the early mornings. The shiny reflective material gives a spaceman-like appearance, attracting almost as much attention as British astronaut, Tim Peake or a Star Wars character! There is enough warmth on the trunk of the body to keep you warm if you come to a stop or slow down to walking pace. In addition, the high collar will protect your neck and chest from the cool night air which can sometimes lead to a chill. Of course the lack of sleeves means that there is no danger of overheating if you up the pace during a competitive event such as night orienteering. A perforated back helps with temperature regulation too. I like lots of room for movement when running, and the Reflect 360 definitely has it, since the cut is not snugly tailored. Very usefully this gilet also has roomy zip-up pockets. Great, though it would have been even better to have one micro-pocket for things like keys and change to cut out the jingle-jangle sound as you bob up and down during your run. I have focused on running in this review, but this Reflect 360 is equally useful for cycling. Overall, this is a very handy piece of kit for your night-time outdoor pursuits. As I mentioned earlier in the year my niece is trying out the Islabikes Cnoc 16. She is enjoying it even more than a few months ago, now that she is riding it everywhere with the pedals on (as opposed to using it as a balance bike). As the weather this December has been glorious there are still lots of opportunities for kids to get out and ride/learn to ride a bike. Islabikes produce good quality frames that are built sturdily to allow for the odd spill. 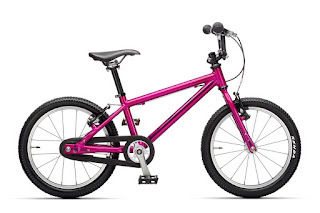 This is great for if you want to save the bike and hand it down to a younger family member, plus these bikes don't lose much value on their price when selling. Components on the Cnoc 16 are the same as those found on adult bikes, so children can get used to the workings of a bike from an early age in readiness for when they move on to a more "grown-up" bicycle. The good thing is that the Cnoc 16 is also lightweight so the littl' uns can use their energy mainly for zooming around further and faster, rather than trying to push off and gain momentum!